Their bizzare shapes, which differ so radically from the traditional fish shape and their comical behavior have placed the mailed catfish in almost every community tank. There are over two-thousand species of catfish world wide, but here we will deal only with the smaller ones suitable for the home Aquaria. To view some statistics on many individual fish, just click on any picture. The Mailed Catfishes are native to the inland water-ways of tropical South America. They are different from other catfishes in structure, due to the overlapping smooth bony plates arranged in two rows on each side of their body. There are also bony plates on top of the head and along the middle of the back. All this body armor gives them the source of their name, or as they are more commonly called the Armored catfishes. They have large movable eyes. The barbels are variable both in length and number. They have a good sized spined Adipose fin. The mouth is small and ventral. Soft bottom material is very important to the Armored catfish, as they like to forage for food in the substrate. Set up the tank with many shelters and caves and have it densely planted, so there are areas out of the direct light. 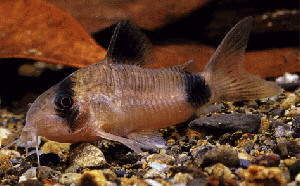 The corys are active during the day, but still feel more secure if they have a darker place to call home. Generally, the Mailed catfish are care-free and will adapt to most aquarium settings. They require no special food, but make sure whatever you feed makes it to the bottom so they get their share. Do not expect them to survive on the leftovers of the other tank inhabitants. The water should be soft to medium in hardness with a pH of neutral to slightly acidic, and a temperature in the range of the middle to upper seventies. There are group and schooling catfish that get along well with each other. There are also loners who always stay away from their neighbors. During mating season some members claim territories around a favorite cave or other structure. This territory is defended from all other members of the same species. Some species practice parental care of their young, and its usually the male who performs this duty. Catfishes are the ideal candidates for community tanks because they inhabit niches and shelters on the bottom not occupied by other aquarium inhabitants. They generally get along well with all types of fish. 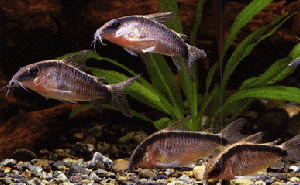 Only in combination with some larger Cichlids can there be a problem as the Cichlids tend to extend their territorial claim to the entire tank. Many catfish will spawn in a community tank, but there are many species that have not yet reproduced in captivity. 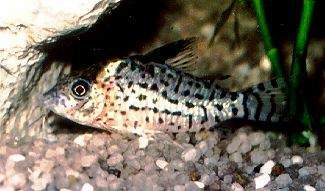 The Mailed Catfish do not pratice brood care. They attach their eggs to plants, rocks or even the glass walls of the tank. You can remove them and place them in a separate rearing tank. When the fry have used up their yolk sac, they can be fed newly hatched Brine shrimp or crushed flake food. As with all fish, water quality must be maintained to get good results.